How to Cite This Chapter: Pernica JM, Goldfarb DM, Duszczyk E, Dubiel B. Varicella. McMaster Textbook of Internal Medicine. Kraków: Medycyna Praktyczna. https://empendium.com/mcmtextbook/chapter/B31.II.18.1.6 Accessed April 19, 2019. Klassen TP, Hartling L, Wiebe N, Belseck EM. Acyclovir for treating varicella in otherwise healthy children and adolescents. Cochrane Database Syst Rev. 2005 Oct 19;(4):CD002980. Review. PubMed PMID: 16235308. Varicella (chickenpox) is an acute systemic viral infection associated with a characteristic vesicular rash. 1. Etiologic agent: Varicella-zoster virus (VZV), which enters the upper respiratory tract and/or conjunctiva and spreads to the reticuloendothelial system where it replicates, thus leading to viremia. VZV infects the epidermal and mucosal cells (as well as many other organs and tissues) and remains latent in dorsal root ganglia. After many years, a latent VZV may reactivate, resulting in herpes zoster (shingles). 2. Reservoir and transmission: Humans are the only reservoir for VZV. The source of infection is a patient with varicella or herpes zoster. Patients with varicella transmit the virus very effectively via droplets and direct contact; secondary attack rates approach 90%, and in temperate countries prior to universal immunization infection was ubiquitous in childhood. Those with zoster are only contagious via direct contact with skin lesions. Varicella can also infect the fetus through transplacental transmission. 3. Risk factors for a severe course of varicella and complications: Pregnancy (susceptible women only), in particular the second and third trimesters; immunosuppressive treatment including prolonged high-dose glucocorticoid therapy (prednisone >20 mg/d, or 2 mg/kg/d for ≥14 days); leukemia, lymphoma, or chemotherapy treatment; primary immune deficiency; newborns of mothers who developed varicella between 5 days prior to delivery and up to 48 hours after delivery; all hospitalized premature infants born before 28 weeks’ gestation; and hospitalized premature infants born after 28 weeks’ gestation to a susceptible woman. Other risk factors for moderate-to-severe disease include age ≥13 years, chronic pulmonary or skin disorders, chronic salicylate therapy, and prolonged aerosolized or low-dose glucocorticoid therapy. 4. Incubation and contagious period: The incubation period is 10 to 21 days (usually 14-16 days); it is prolonged to 28 days in immunocompromised patients who receive postexposure prophylaxis with varicella hyperimmunoglobulin and shorter (2-16 days) in newborns exposed in the perinatal period. Individuals are infectious from 24 to 48 hours prior to the onset of rash until all vesicles have dried and crusted over (usually after ~7 days). Varicella is rarely asymptomatic, though it is not uncommon for seropositive adults (and their immediate family members) to have no recollection of childhood illness. 1. Prodromal phase: One to 2 days prior to the onset of rash nonspecific symptoms appear, including fever, malaise, headache, myalgia, pharyngitis, rhinitis, and loss of appetite. Occasionally, abdominal pain and diarrhea can be observed. 1) A generalized, very pruritic vesicular rash, which begins as erythematous macules that evolve into papules 5 to 10 mm in diameter, with subsequent formation of vesicles filled with fluid that is initially clear and later becomes turbid. After 2 to 3 days, the lesions evolve into pustules, which dry and crust over the next 3 to 4 days. The crusts eventually fall off, leaving discolorations that disappear in patients with uncomplicated disease. Hemorrhagic lesions may develop in immunocompromised subjects. 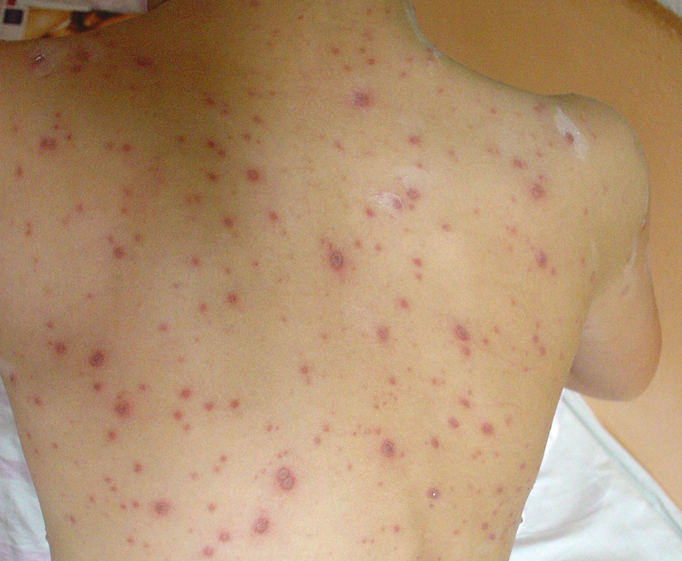 Because successive crops of skin eruptions appear over the initial 3 to 4 days, the fully developed rash is polymorphic, that is, consists of “crops” of lesions at various stages of evolution (“starry sky” appearance: Figure 1). Eruptions appear on the head (including the scalp) and trunk, later on the arms, and eventually involve the lower extremities (rarely the hands and feet). A vesicular rash that begins peripherally and does not exhibit “crops” in different stages of development is unlikely to be varicella. The number of lesions varies, ranging from less than 10 to several hundred. In 10% to 20% of patients, the lesions are found on the oral, pharyngeal, and genital mucosa, as well as the conjunctiva and cornea (fine ulcerations). Rash in immunized individuals (“breakthrough varicella”) almost always involves many fewer lesions, which usually appear atypical (ie, are not vesicular) and cause much less pruritus. 2) Fever (usually within 4 days from the onset of the rash) and lymphadenopathy are common with primary varicella and very unusual with breakthrough disease. 3. Perinatal/neonatal varicella results from infection of the fetus around the time of delivery. Infants born to mothers in whom the onset of rash occurred within 5 days before delivery or 48 hours after delivery do not receive protective maternal antibody and develop transplacental viremia; consequently, they frequently develop severe disseminated disease (including pneumonitis, hepatitis, and meningoencephalitis) and outcomes are very poor. 4. Congenital varicella results from transplacental infection of the fetus early in gestation. Infection in the first and second trimesters leads to fetal death or congenital varicella syndrome (in 1% to 2% of newborns born to mothers who acquired varicella within the first 20 weeks of pregnancy)—limb hypoplasia, violaceous cicatricial skin scarring, central nervous system defects (microcephaly, developmental delay, seizures), cataract, retinitis, and uveitis. As symptoms and signs are the result of the disruption of normal embryogenesis from a long-ago infection, these neonates are not usually acutely unwell, though the overall neurodevelopmental prognosis is not good. Infants born to mothers who acquired varicella after the 20th week of pregnancy do not develop congenital varicella syndrome but may develop herpes zoster early in life. Diagnosis is usually based on the clinical presentation of a polymorphic vesicular rash and a history of contact with a sick person, though this is substantially more difficult in the era of universal immunization. Diagnostic tests are recommended in equivocal cases and in those with the possibility of severe disease (risk factors: see Definition, Etiology, Pathogenesis, above) who might benefit from antiviral therapy. 1. Detection of VZV using viral culture or polymerase chain reaction (PCR). Culture usually takes up to a week and is less sensitive; consequently, PCR is generally preferred. New vesicles should be de-roofed and swabbed to obtain specimens for testing. Genotyping can also be used to distinguish vaccine from wild-type strains. 2. Detection of VZV antigens in epithelial cells using a direct immunofluorescence assay (specimen: scrapings from the base of the vesicles); this is less sensitive and specific than PCR. 3. Serology is not useful as a rapid diagnostic test. Detection of specific serum IgG is usually helpful in confirming prior infection and acquired immunity. Many commercially available (whole-cell lysate) enzyme-linked immunosorbent assays do not have good sensitivity for the detection of vaccine-induced immunity, so such testing of immune responses is not routinely recommended. Other infections that can lead to generalized vesicular rashes include enteroviruses and disseminated herpes simplex (“eczema herpeticum”), especially in individuals with preexisting atopic dermatitis. Smallpox and monkeypox present in a similar fashion to varicella but are extremely rare and are associated with specific features on history. Bullous impetigo (often caused by staphylococcal infections) typically features bullae, not small vesicular lesions. Noninfectious causes of vesicular lesions include drug rashes, atopic dermatitis, and papular urticaria. In immunocompetent patients ≤12 years of age and in patients with mild varicella, no specific therapy is indicated.Evidence 1Weak recommendation (downsides likely outweigh benefits, but the balance is close or uncertain; an alternative course of action may be better for some patients). Moderate Quality of Evidence (moderate confidence that we know true effects of the intervention). Quality of Evidence lowered due to imprecision and indirectness. Klassen TP, Hartling L, Wiebe N, Belseck EM. Acyclovir for treating varicella in otherwise healthy children and adolescents. Cochrane Database Syst Rev. 2005 Oct 19;(4):CD002980. Review. PubMed PMID: 16235308. Antiviral treatment for previously healthy children aged <18 years demonstrated that acyclovir (INN aciclovir) started early in infection reduces the duration of fever by ~1 day and reduces the overall number of lesions, but leads to no other improvements in outcomes (including the duration of pruritus). Daily baths or showers followed by careful drying of the skin with a towel are recommended in all cases. Antihistamines can reduce pruritus. Acetylsalicylic acid (ASA) should be avoided; ASA therapy during varicella has been associated with the development of Reye syndrome. 1) In those with risk factors for moderate to severe disease (including age ≥13 years, chronic pulmonary or skin disorders, chronic salicylate therapy, and low-dose systemic or aerosolized glucocorticoid therapy) and pregnant women, use oral acyclovir 800 mg qid a day for 5 to 7 days, starting within 24 hours of the onset of rash. 2) In patients at high risk for severe disease (including malignancy, immunosuppressive medications, primary immunodeficiency, or neonates with perinatal transmission) or those with severe or complicated VZV infection (including pneumonia or central nervous system infection), administer IV acyclovir 10 mg/kg every 8 hours for 7 to 10 days. Due to the risk of crystal precipitation in the kidneys, maintaining an appropriate hydration (urine volume) is mandatory in the course of the treatment. Thus, crystalloid infusion prior to IV drug administration is recommended (eg, isotonic fluid with a volume at least equal to the volume of drug infusion); serum creatinine and urine output should be monitored regularly. In patients with renal failure, the dosage should be adjusted. 1) Localized (Streptococcus pyogenes, Staphylococcus aureus): Abscess, phlegmon, erysipelas, wound-associated scarlet fever. 2) Precursor to invasive infection (S pyogenes): Necrotizing fasciitis, bacteremia, toxic shock syndrome. 1) Varicella pneumonia (interstitial pneumonitis) is the most common complication in adults (incidence, 1/400 cases), particularly in pregnant women in the second and third trimesters and in immunocompromised patients. Tachypnea, cough, and shortness of breath usually develop on days 3 to 5 of VZV infection, and outcomes are frequently poor. 2) Secondary bacterial pneumonia (most frequently caused by S aureus, sometimes by Streptococcus pneumoniae, Haemophilus influenzae) may complicate the course of varicella pneumonia or develop independently (even during convalescence). Secondary bacterial pneumonia is difficult to distinguish from varicella pneumonia; thus, it should be always taken into consideration when establishing the diagnosis. 1) Cerebellitis (cerebellar ataxia) is most common in children <15 years (incidence, 1/4000 cases), usually develops in the first 3 weeks of VZV infection, and has a benign course, resolving within 3 to 4 weeks. 2) Encephalitis occurs predominantly in adults (incidence, 1-2/1000 cases) and has a severe course, usually lasting ≥2 weeks; mortality rates are 5% to 20%, and up to 15% of survivors can have permanent neurologic sequelae. 3) Reye syndrome (encephalopathy with hepatic dysfunction) is most commonly seen with ASA use, especially in children; it is now very rare. Reye syndrome is associated with rapid progression to coma and a poor prognosis. 4) Meningitis, transverse myelitis, Guillain-Barré syndrome, cranial nerve paresis, retinitis (may occur even a few weeks after the onset of varicella). 4. Other (rare): Myocarditis, arthritis, nephritis, symptomatic hepatitis, thrombocytopenia, urethritis and/or cystitis (dysuria). In immunocompetent patients, varicella usually has a mild course; the infection confers life-long immunity. In high-risk groups, the course of varicella is protracted, more severe, and associated with an increased risk of complications. Deaths related to varicella complications are rare (1/50,000 cases; in adults, 1/3000); however, mortality rates are up to 15% in immunocompromised patients and ~40% in pregnant women who develop pneumonia. 1. Vaccination (see Immunoprophylaxis of Infectious Diseases in Adults) is the key prevention method. Two doses of varicella-containing vaccine are recommended after 1 year of age given the higher risk of breakthrough infection seen in one-dose regimens. 2. Active postexposure immunization should be provided as soon as possible (up to 120 hours after exposure) for nonimmune individuals >1 year of age, provided there are no contraindications. 1) Newborns of mothers who developed varicella from 5 days before to 2 days after delivery. 3) Individuals with malignancies or undergoing chemotherapy or immune suppression without a history of VZV infection or completed immunization. 4) Patients after hematopoietic stem cell transplant, including immune individuals who are highly immunosuppressed (due to high-dose steroid therapy or T-cell depletion). 5) Hospitalized premature newborns born <28 weeks’ gestation or born >28 weeks’ gestation to susceptible women. 4. Prophylactic pharmacotherapy: In the patients at high risk for severe varicella (above), if VZIG is not available or >10 days have elapsed since exposure, oral acyclovir 800 mg every 6 hours for 7 days starting on day 7 after exposure can be considered.Evidence 3Weak recommendation (benefits likely outweigh downsides, but the balance is close or uncertain; an alternative course of action may be better for some patients). Moderate Quality of Evidence (moderate confidence that we know true effects of the intervention). Quality of Evidence lowered due to imprecision and indirectness. Remark: The same data led to suggestion against treatment in otherwise immunocompetent healthy individuals and for treatment in patients at high risk of severe varicella who do not receive immunoglobulin prophylaxis. Klassen TP, Hartling L, Wiebe N, Belseck EM. Acyclovir for treating varicella in otherwise healthy children and adolescents. Cochrane Database Syst Rev. 2005 Oct 19;(4):CD002980. Review. PubMed PMID: 16235308. The rationale for this is to optimize the efficacy of treatment by ensuring that there is no delay in the institution of antiviral therapy. 1) Patients with varicella: For at least 5 days after the onset of rash and until all lesions have crusted over. In the case of a maculopapular rash in vaccinated individuals, isolation should continue until no more new lesions appear and/or lesions start to resolve (fade, but not necessarily disappear). Cases of breakthrough varicella with <50 lesions are approximately a third as infectious as varicella in susceptible persons. 2) Susceptible individuals who had contact with a patient with varicella: Between days 7 and 21 following the exposure, or up to day 28 if VZIG or intravenous immunoglobulin (IVIG) was administered. If possible, the exposed patients should be discharged, while the exposed susceptible health-care personnel should be temporarily reassigned to areas other than patient care. 2. Serologic screening of unvaccinated health-care personnel and high-risk individuals without a history of varicella infection or for whom vaccination records are not available: Prompt vaccination of patients with negative varicella titers (IgG, above a certain level, indicating past infection), unless specifically contraindicated. Figure 1. Varicella. Vesicular rash at various stages of evolution (“starry sky” appearance).